“If that isn’t Chinese Brady I’ll eat my boots!” Major Bill Abel and Colonel Rog Wharton recognized the new pilot immediately. His graying hair might be dyed black, but these two old war horses would never forget the man who had saved their lives in Shanghai during the 1900 Boxer rebellion. For Chinese Brady, war and excitement were like bread and butter. He was known far and wide as a fierce warrior, a soldier of the world. 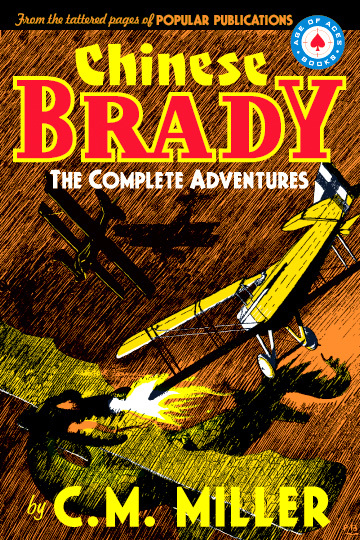 And after almost twenty years of scrapping in every war and revolution, in every corner of the globe, Brady was going to finally fight under his own flag, as a Captain in the WWI American air force. But rank didn’t matter to him. After all, he had been a Prime Minister in Abyssinia, a General in China, a Major in Honduras, a Chief of Staff in Mexico, and a buck private in Guatemala. What did matter was that he could now bring his savage skills to bear against Germany, to save Europe from the Kaiser and all his evil minions! The tales of Chinese Brady were written by C. M. Miller. They appeared in Popular Publications’ Battle Birds and Dare-Devil Aces from 1933 through 1940, thirteen of them in all. And Age of Aces is bringing them to you, collected for the first time in one volume.